Most Comfortable And Best Aero Bars For Mountain Bike Riders. What’s The Best Aero Bars For Mountain Bike Riders. Most riders commit a significant amount of time hunting down mountain bike upgrades such as saddles, pedals, and grips- but forget about aero bars for mountain bike. Yet, choosing suitable aero bars gives you the ‘aero advantage’ and can dramatically improve your performance and comfort. This means you will slice through the air at a refreshing efficiency. More to that, you enjoy a comfortable hold when on a difficult climb. What Are Mountain Bike Aero Bars? 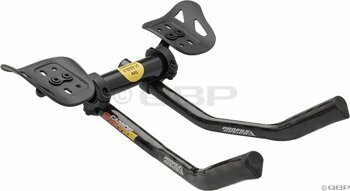 Mountain Bike Aero Bars are useful handlebar extensions with cushioned forearm rests and get you into an improved aerodynamic position by nudging your body forward- into a tucked position seemingly with a lightly dropped torso. Adding aero bars (sometimes call bull horns) perfects your overall body positioning meaning you will achieve more speed due to an easier ‘cut’ through the wind. Most of the latest mountain bike aero bars also have comfier padding that makes taxing trips to the wild easier. By grasping the “drop bars”, you reduce the frontal area lowering the resistance levels which ultimately helps to increase your riding efficiency. The higher efficiency means you will conquer climbs more easily than when you ride without the clip-ons. 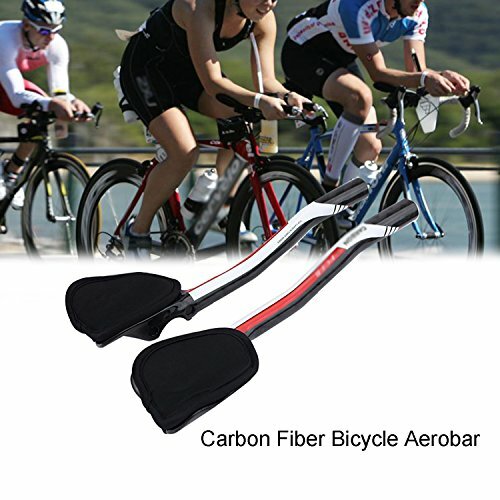 Aero bars are designed to transform your main bike support mechanism to skeletal from muscular. This reduces the drag, which translates to a faster ride, and increased fun. That explains why you also find aero bars in thrills like time trialing and triathlons. Adding adjustable aero bars give you multiple hand positions, awesome control, and depending on circumstances, can make your ride more forgiving. They also provide an alternative ‘hand’ and some sort of “resting” positions when tackling extreme distances. Different Types Of Aero Bars For Mountain Bike. 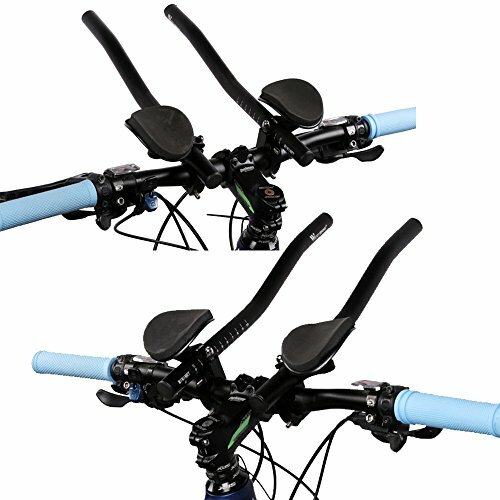 Also called “triathlon aero bars”, “clip on aerobars”, or just “tri-bars”, these mountain bike handlebar extensions are mounted near the center of your handlebars and the cantilever brakes over the front. They are designed for top aerodynamics and every aspect of their build is non-fussy and practical. Most also look and feel nice and while their comfortable armpads relieve soreness. If you would want to see how clip on aero bars look like, I would recommend the VAQM Mountain Bike clip on aero bars. It’s a sleek design and gives way to a cozier riding position for daily evening rides or longer distance weekend trips. It’s also a good bet if you will be attending your first triathlon with a mountain bike. The ergonomic models offer an impressive range of adjustments allowing you to attain the perfect balance of comfort and aerodynamic positioning. Thanks to the easy-to-access clamps, holes, and a series of bolts/screws, you can practically adjust it in every possible way. For instance, you can shift the padded armrests forwards/backward, side-to-side, and even twist their angle inwards. Their extensions can also be moved as well as being rotated. The West Biking ergonomic Tri Aero Bars best represents this category of aero bars for mountain bikes. As you will see, you can adjust it to its last angle. These brilliantly combine the attributes you need to beat the clock, namely aerodynamics, comfort, and extremely low weight. Plus, they have all your essentials including variable armrest positions which helps angle the arms in a position from which you can pedal aggressively. They stay in place, rock solid, and have fantastic looks. Well, I had some trouble trying to get these, but my persistence finally paid off when I stumbled on the Top Home TT mountain bike Aero bars. The aero bars are popular among time trial enthusiasts because of their strong aero position. Things To Consider While Buying The Best Mountain Bike Aero Bars. Aero bars can be constructed of carbon, aluminum, or alloys. Carbon is absolutely light and the most ergonomic. You can thus fine-tune carbon to create the perfect mix of strength, low weight, and conformity. Sadly, carbon is the most expensive. Some of the best aero bars are multi- adjustable and offer Independent rest and bar adjustments. You will be able to modify the bar length, bar width, bar angle, armrest angle, and even placement. Such bars are by far more comfortable since you can always change the settings depending on the terrain and conditions. Heavier models will add more weight to your mountain bike and make it difficult uphill and could cancel out the benefit of speed downhill. The rule of the thumb is that everything else being constant, lighter is faster so focus on lightweight brands. 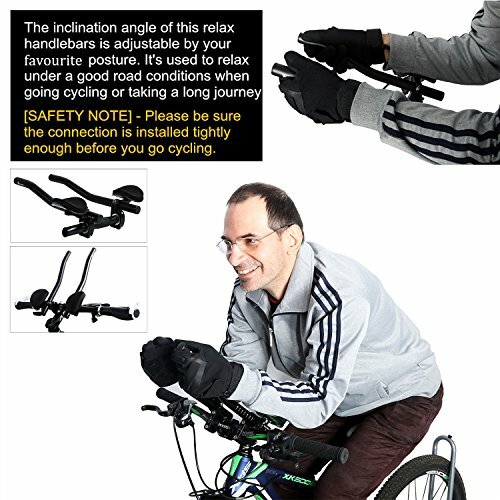 Extremely wide clip on aero bars can put more pressure on the neck and your arms, and cause you to feel as if you’re driving a truck. Exceedingly narrow bars make you feel constrained though I should point out that narrower aero bars bring your elbows inwards and can greatly upgrade the aerodynamics. Still, some aero bars are designed for handlebars with a specific diameter and would not be comfortable in other bikes. Don’t forget to check the overall quality.. I am referring to the workmanship, finishing, shaping, padding, cable routing, and more. This should give it a nice touch feeling and make the aero bar easy on the hands. The best aero bars should be easy to install. Tightening the screws and the installation compounds should be a straightforward affair. Similarly, it should allow you to add the flip-up arm rests- where necessary- in a flash. My Top 3 Recommended Aero Bars For Mountain Bike. As I’m wont to do, I spent some time studying aero bars for mountain bike and unearthed some true gems. These mtb aero bars are designed to help you race and win against the clock with the carbon aero extensions giving your mtb the aerodynamics to cut through resistance and topple the competition. And if you want to emerge tops on climbs, they allow you to add flip up brackets which should put you at a vantage climbing position. The bars are extremely comfortable and with the anatomic armrests adjusting to your preferred position, these give one of the comfiest rides. They are full carbon mountain bike aero bars so they also feel light yet are super sturdy. Okay, they don’t come with the flip up brackets but overall, the quality is up there with the best. In short, if winning a triathlon is one of your dreams, these easy-to-install aero bars for mountain bike could be your ace card. 2. Top Home Dec TT Handlebar Aero Bars. 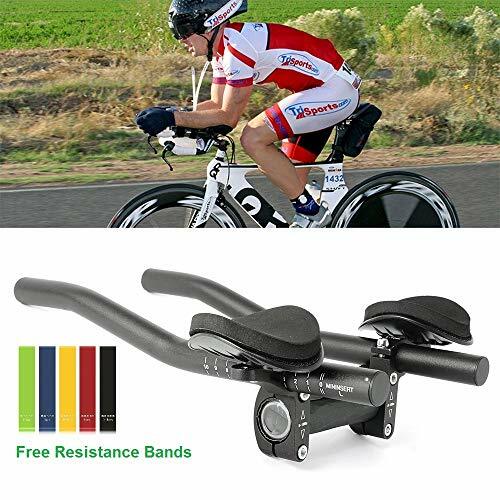 Ergonomical and with countless adjustments, the top home TT handlebars aero bars bike rest give the profile design carbon styke bicycle handlebar armrests a real run for its money. 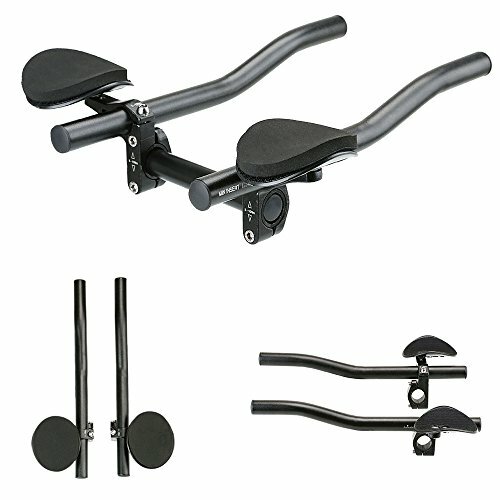 The design mode and the available modifications let you tailor this bike arm rest bar to the circumstances making these bars one of the most versatile options in the market today. Subsequently, you can use them as your preferred aero bars for bikepacking in road bikes for your next race or for a comfortable long-distance scenic ride on your mountain travel bike. It’s not carbon but the used aluminum is of impressive quality and should last while the overall workmanship looks fine. The foam padded hand rests are quite comfortable and should help you maintain a winning aerodynamic tuck position for your time trials. The other winners in these Tri Aero Bars are the easy installation, straightforward cleaning (shims are removable), and the gorgeous looks. The platt mountain bike handlebar aero bars are another set of superior set of tri bars for mountain bike at this level and work well for most mountain bikes. They flaunt a sleek carbon fiber tube, super comfortable padding, and well-placed internal routing ports and reeks of quality through and through. These are designed for handlebars with diameters of 31.8mm and work awesomely not only on MTBs but also as aero bars on touring bike if you want comfort as well as for your triathlon rides if you’re after speed. At 300g, these are in the lighter range while the gloss finish coupled with the excellent workmanship gives them a nice feel on touch. And the manufacturer is also very helpful in case you have problems with these aero bars for mountain bike. Aero bars for mountain bike play a massive role in decreasing riding drag. By improving aerodynamics, your mountain bike becomes more athletic and highly efficient to ride across the picturesque mountains and/or win time trials. Your comfort, performance, and ability to ensure long rides may thus hinge on aero bars for MTBs.